This Sunday, 26 November 2017 is ‘Stir-up Sunday’, so put on your apron and gather family or friends to make a Christmas pudding. It’s the day when wishes come true, so get stirring! According to tradition every person in the household including the children take a turn to stir the Christmas pudding mixture and make a wish. The Christmas pudding is one of the essential Christmas traditions and is said to have been introduced to Britain by Prince Albert, husband of Queen Victoria. 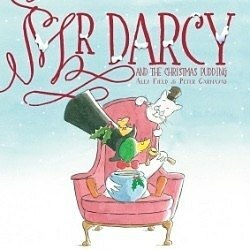 Stir-up Sunday is the basis for Mr Darcy’s latest adventure in Mr Darcy and the Christmas Pudding. All his friends take a turn stirring the mixture. Can you guess Mr Darcy’s wish? Join in the fun and get cooking with family and friends this Sunday. Good luck!